Do you want to remove or uninstall Avast SafeZone Browser by Avast Free Antivirus from Windows computer? It is very important to have a powerful antivirus software or malware protection software installed on a computer. There are a lot of benefits of using a good antivirus program as it will help you in keeping your computer secure from viruses, malicious attacks and much more. With the new technology, most of the antivirus software companies are developing plenty of new computer protection software and internet monitoring software which provides better security online and offline. SafeZone Browser is also one of the part of such built-in programs launched by Avast (Avast Free Antivirus) which provides better web searching security and protection from all the online threats. This Web browser software comes with good features and will definitely add a layer of protection to your computer once you installed it. Lately there are many complaints of Avast Safezone Browser by the users who are using it. So, if you are also not happy with Safezone Browser then you can easily uninstall Avast safezone browser without uninstalling Avast Antivirus. Yes, you heard absolutely correct. There is no need to remove complete Avast Antivirus software from your PC in order to remove Avast Safezone Browser only. Today in this Antivirus software for Windows tutorial, we are going to explain you how to remove Avast safezone browser completely, but before that let’s find out what is Avast safezone browser and what are some most special features of SafeZone Browser? Here we go. Avast SafeZone Browser is a web browser which comes with all the safety features of Avast Antivirus. You can use Safezone Browser from Avast antivirus which leaves the installation of any third party softwares. There are integrated anti malware layers in this software which will provide you better security. Using different browsing modes, you will be able to make safer transactions and can protect your children from unsafe content. Some of the most helpful features offered by SafeZone Browser are: Security provided by integrated anti-malware layers, Specialized browsing modes for completely safe transactions online and protection from unsafe content, Convenient video downloads, Easy price comparison on trusted shopping sites, Ad-blocking to block ads and make browse faster, Quick filters that block pages with poor reputations, and many more. Please don’t forget to check: What is the Fastest Web Browser for Windows 10, 8 and 7? In simple words. Avast SafeZone Browser is one of the components that gets automatically installed on your Windows computer without notifying you when you install the Avast free antivirus solution. But there is no need to be worried, you can always manage program components in Avast Antivirus setup configuration according to your wish. If you are pretty much satisfied with the amazing services provided by the popular web browsers like Google Chrome, Mozilla Firefox, and Internet Explorer etc. and also don’t want to use any other internet browser like SafeZone browser anymore then removing it from your computer is the best choice. Step (1): When you are installing Avast free Antivirus on your PC, you will see a “Customize” button as shown below in the screenshot. The button will be located just below the orange color “Install” button. 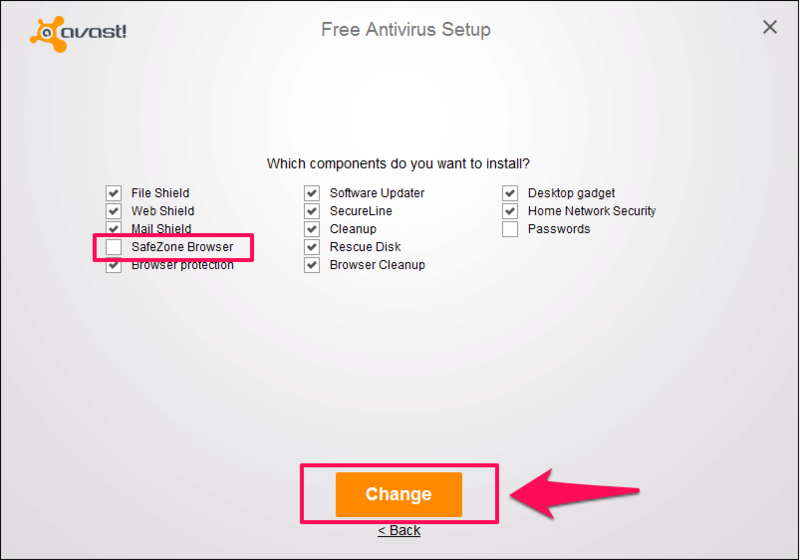 Step (2): Click on “Customize” button to go on Avast Free Antivirus Setup page. 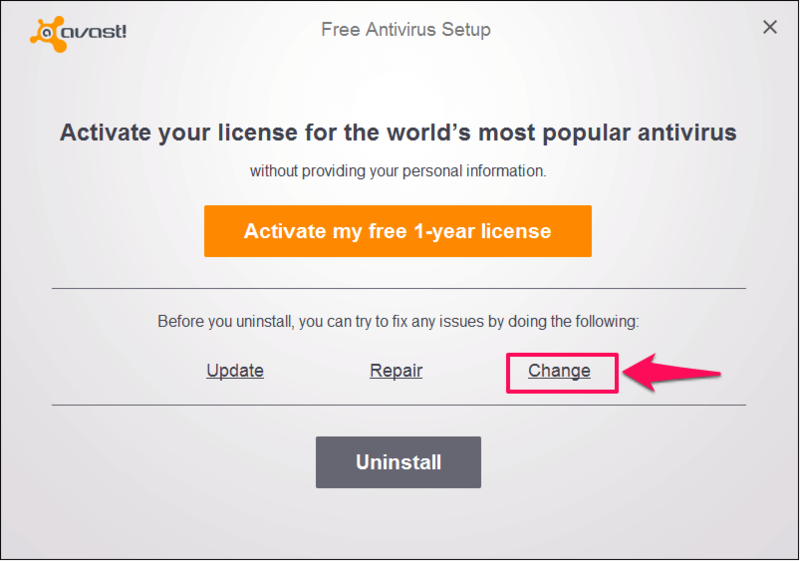 Step (3): On the Avast Free Antivirus Setup page, you will see all the additional components which will be installed by Avast on your system. Step (4): Here you have to find “SafeZone Browser” option from the options displayed and uncheck it. Step (5): If you don’t want to install any other component, you can uncheck that too from the list. Step (6): Once the selection is done, you can continue the installation process by clicking the “Install” button. Make sure that you are performing all the above mentioned steps on the latest version of Avast antivirus 2016 (Avast free antivirus download for PC, Mac & Android). 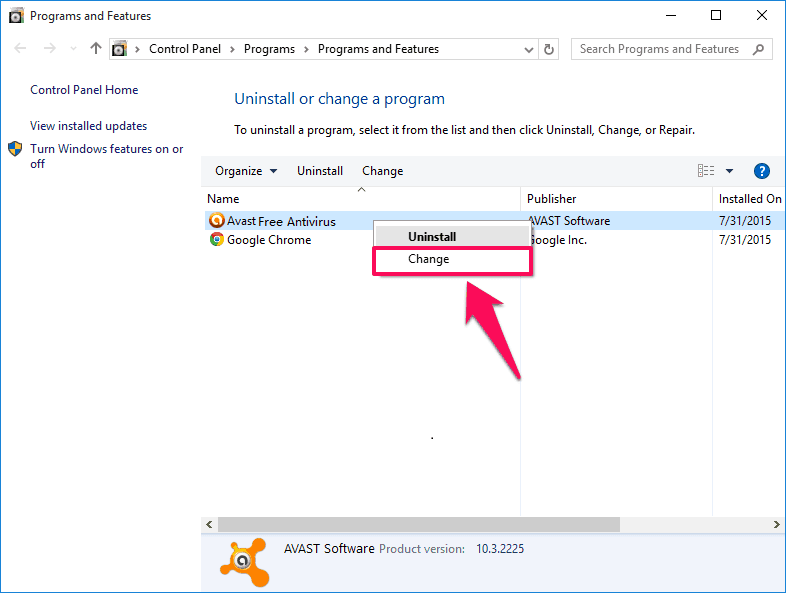 Thus, you can see how simple is to ignore the installation of Avast SafeZone Browser while installing Avast antivirus software on Windows computer. Step (1): First of all, open “Control Panel” on your Windows computer. Step (2): You will see a lot of options in Control Panel. Select “Uninstall a Program” option link. Step (3): Now you will come across all the programs installed on your computer. Find “Avast Free Antivirus” or “Avast Premier” from the list and right click on it then select “Change” option. Step (4): Now, Free Antivirus Setup page will appear. Again you have to select “Change” option. Step (5): All the installed components of Avast antivirus will be displayed on your computer screen. Step (6): Uncheck the “Safezone Browser” option. If you want to remove any other component you can select it from here. Finally, click on “Change” button. Step (7): Once the changes are done, you will see a notification on your computer screen saying “The Product was updated successfully”. That’s it! Now, reboot your computer and Avast safezone browser will be no more installed on your computer. The above mentioned methods will perfectly work on your Windows PC if you are using the latest version of Avast antivirus 2016. Uninstalling or removing SafeZone Browser from Windows computers is pretty simple as you have already seen in above methods. We hope now you know very well how to uninstall Avast Safezone Browser without removing Avast Antivirus from PC.